Medium: original etching. 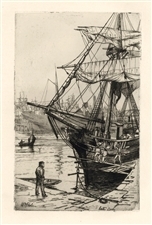 This impression on Arches laid paper printed in 1880 for Philip Gilbert Hamerton's very scarce "Etching and Etchers", issued in an edition of 1000. Plate size: 8 x 5 inches (200 x 127 mm) with good margins. Signed by William Hole in the plate (not by hand).